I guess that at some point anyone doing Inq28 models will have do an Inquisitor. They are tough cool looking models - or sneaky ones. This guy falls in the first category. 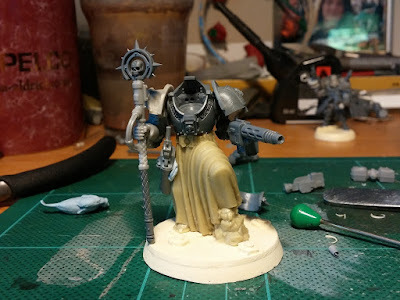 Not sure if I'll keep the staff top - could look good with a huge hammer too I think. Shoulderpads are also still up for debate. Pose is great. Hammer would definitely bring a more brutal feel to the model. He is looking good! I would vote to keep the staff. A big hammer would distract from the character themselves. He can kill people without the help of some oversized hammer! Just my thoughts though, a hammer would still look great. Good luck finishing the conversion! Cheers, decided to go with the hammer - looks more intimidating and brutal - but I see where you come from.